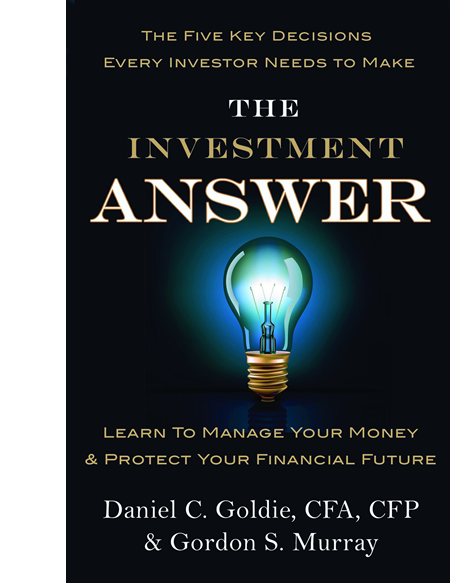 Recently finished reading "The Investment Answer" and found it a solid book. 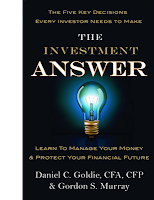 Written by Daniel Goldie and Gordon Murray, it's a basic (about an hour to read) primer on investing co-written by a Financial Advisor (Goldie) along with a Wall Street guy (Murray). I heard about it through the Mike Cassidy piece Gordon Murray dedicated his final days to giving us 'The Investment Answer' from the San Jose Mercury News. As could be gathered from the Cassidy title, Murray has since passed away and Cassidy's story behind the book and the authors is an interesting one. - Don't get caught up in past performance as an indicator of future success. - Don't go it alone... use a Financial Advisor, but a Fee-Only Advisor, not a Retail Broker. - Asset allocation decisions are more important than choices around individual stocks... and play heavily in the area of risk/reward decisions around an investment strategy. - Diversification (multiple asset classes) and passive investing following a strategy trumps going all-in on a stock or asset class and frequently changing courses. Simple stuff to be sure, but probably not simple to people who might have been burned by polar opposite approaches towards investing.